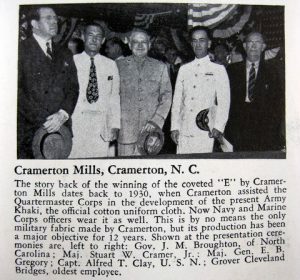 The company first manufactured Cramerton’s famous 8.2­ounce “Army khaki” in 1929. 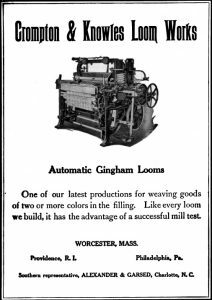 There is no doubt that his son, Major Stuart W. Cramer, Jr., an officer in the US Army strongly influenced the decision to develop an improved fabric for military uniforms. It became the staple of the U. S. military in World War II and was worn by millions of soldiers throughout the world. 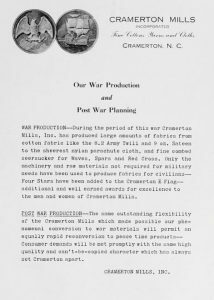 At the beginning of the war, Cramer voluntarily released the technical know­how to allow other producers to duplicate his fabric. 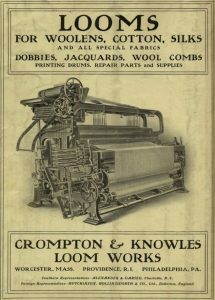 Today the famous name has been registered and reintroduced by Dockers as “Cramerton khaki”. 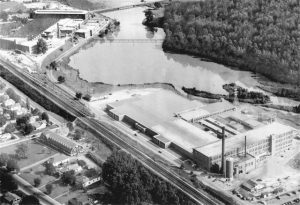 The Mays plant was closed in 1975 and leveled in 1977. 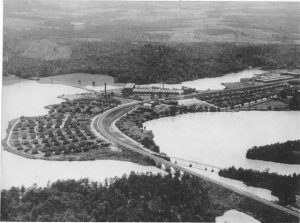 In January 1978, the decision was made to close Mayflower and W. G. Lord. 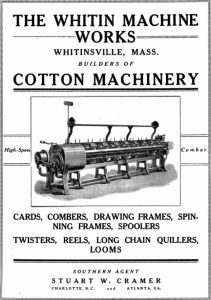 The Lakewood facility became part of the Knitted Fabric Division. That too was closed in 1999. 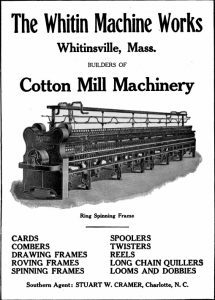 Ragan, Robert Allison, The Textile Heritage of Gaston County North Carolina 1848­ – 2000. Charlotte: R.A. Ragan & Co., 2001. 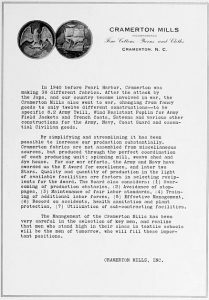 Cramer Mountain community website www.cmhoa.com/history.aspx Accessed July 30, 2012. Chris Bell, Private communication November 2009.